Alright, I’m sorry to start with such a graphic image but at least maybe it’ll get some attention. When you first see Andrew W.K. or listen to his music, what do you think? Do you think “classically trained musician?” Do you think “tours with string orchestras?” Do you think “astute investor and owner of one of the largest clubs in NYC?” If so, I commend you for being unstoppably perceptive. AWK is all of those things above, and more. His first release, I Get Wet, is full of non-stop catchy and powerful rock songs. It’s not ironic, it’s just good. “She Is Beautiful” is simply the most fascinating piece on the album. From that opening riff you’re already hooked for the length of the song, but the bridge is where it really shines. As the first true love song on the album, it just sounds like a regular party song until the bridge. You’re afraid that he’s just singing about this girl, but then it becomes super clear that he is invested and gonna do what he can to be with her, all in time with the music itself shifting your attention away from the previous verses. That’s the sound of hopefulness for AWK. Get motivated yourself! Get it here. 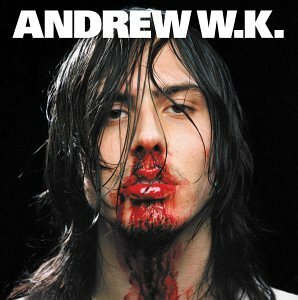 The album cover above was achieved by Andrew W.K. hitting himself in the face with a brick, but when there wasn’t enough bloodflow from himself he had to use some animal blood. Whoops! And finally, this is the first of my favorite songs. I think I’m gonna do twenty, so consider this one #1. Not ranked, just listing them.